Lock in a great price for Sunrise Hotel & Camping – rated 9.5 by recent guests! Fitim, the host, is super friendly and nice person. Despite I came too late, he transferred me from somewhere to very comfortable and cozy hotel. He also showed all beautiful places around. The location of the hotel&camp is perfect: nature around, pretty close to the city, not crowded beach is nearby. You can use kayaks or bikes (by the way, it's very convenient to explore the city by bike). 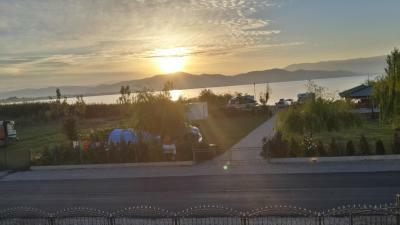 Room was well furnished, absolutely gorgeous view to the Ohrid lake from the balcony. Cheap, but very delicious breakfast is highly recommended! Fitim is very helpful, kind and reliable person. Hope to see him again one day :) Thank you for your hospitality! Very friendly owners. They were very help full. Facility has access to private beach, lounges and boats on beach for free use. I can really recommend! 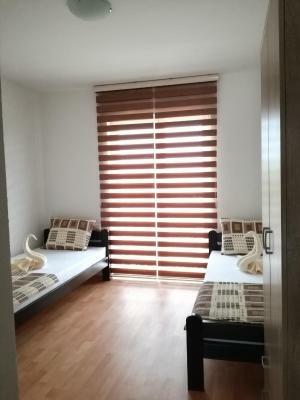 Very spacious and clean rooms. Extremely friendly staff. We paid exactly that as a price we booked. The photos in Booking does not really reflect the rooms - they are actually more modern and bigger than in the photos. Excellent price-quality ratio. Perfect experience! We enjoyed every moment. Magical place. 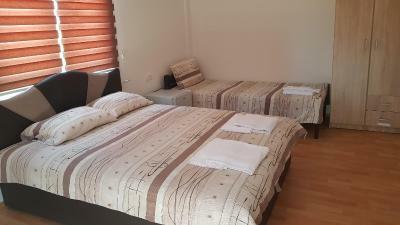 Large and clean rooms, wonderful staff, fantastic private beach. We planned one night and ended up staying another 5 nights. We'd love to go back for another vacation. Amazing place, beautiful view from the terrace on Ochrid Lake. Wonderful sunrises each day from my room 😃 very helpful and nice Staff. Highly recommend! Great helpful staff. Access to the lake. Room at best standard. Everything was perfect! It is clean. Very kind staff. Fancy place. Close to the center of Struga. 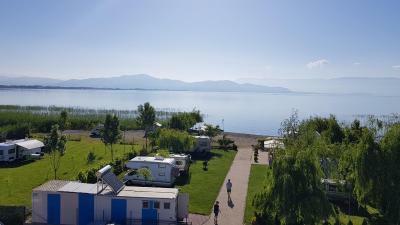 Amazing hotel nearby the Ohrid lake, with amazing view on both lake and mountain side. The staff was really nice, a free welcome drink was offered to us during our check-in. I can highly recommend! 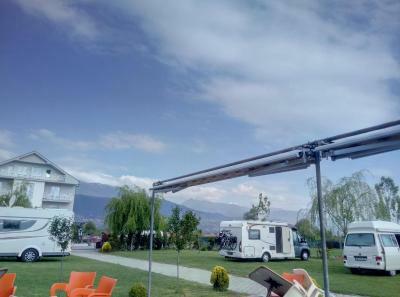 Located 1.1 mi from Kalishta Monastery in Struga, Sunrise Hotel & Camping welcomes guests with a restaurant and bar. Free WiFi is available and free private parking is available on site. Each room is equipped with a flat-screen TV. Views of the mountain, lake or city are featured in certain rooms. For your comfort, you will find free toiletries and a hairdryer. This hotel has a private beach area and free use of bicycles is available. Saint George Church is 1.9 mi from Sunrise Hotel & Camping, while Nature Museum is 2.5 mi away. 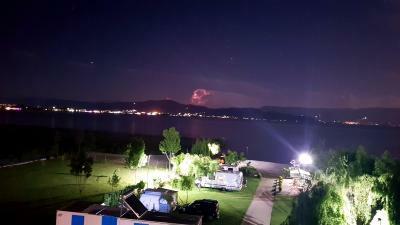 Ohrid Airport is 7.5 mi from the property. 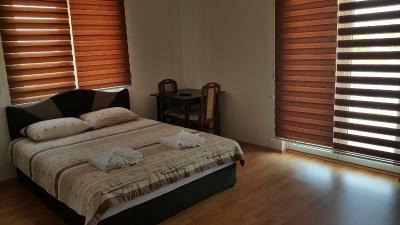 This property also has one of the top-rated locations in Struga! Guests are happier about it compared to other properties in the area. 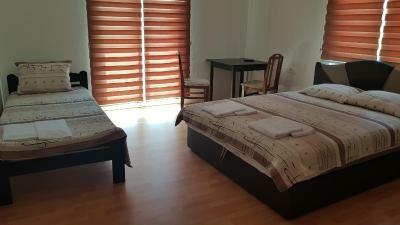 This property is also rated for the best value in Struga! Guests are getting more for their money when compared to other properties in this city. When would you like to stay at Sunrise Hotel & Camping? House Rules Sunrise Hotel & Camping takes special requests – add in the next step! Next to the main road leads to increased noise. Everything was great. Just perfect. Verry loud at night from cars and can't sleep because they don't have air condition and mast sleep with open window. Clean rooms and good parking. Nice quet plice. Very polite staf.